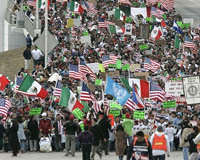 Click on an image to watch a slide show of the immigrant rights march in Milwaukee on 23 March 2006. March 23, 2006 was a historic day for Milwaukee. It was a day of Latinos in a city that still thinks of itself stereotypically as either a German/Polish Old World European enclave or a post-industrial, predominantly African-American ghetto, plagued with violence and urban blight. 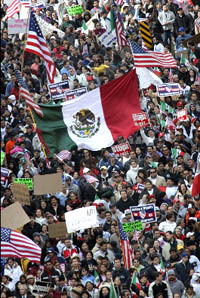 It was a day when thousands of Latino workers and their families took their children across the 6th Street Bridge from the once mostly Polish Southside to downtown’s Zeidler Park (named after Carl Zeidler, the brother of German-American Socialist Mayor Frank Zeidler), where Milwaukee’s predominantly white political and economic elite work, to demand that they not be treated as criminals in a land settled and built by immigrants. They demanded that the state and federal governments not pass laws, like H.R. 4437, sponsored by Wisconsin’s own James Sensenbrenner, which would criminalize them for wanting to make a better life for themselves and their families. Symbolically, this march was historic because just by their presence Milwaukee’s Latino community showed, in a dignified way, that they belong to the city and are not willing to be taken for granted anymore. During the 1960s and 1970s, Milwaukee’s civil rights movement, led by Italian-American Father James Groppi, marched across the 16th Street Bridge to demand equal housing and dignity for all of Milwaukee’s citizens. An old racist joke named Milwaukee’s 16th Street Viaduct the longest bridge in the world because it linked Poland to Africa. But after March 23, 2006, the newly-renovated, David Kahler-designed 6th Street Bridge should become a symbol for a new Milwaukee that is being revitalized by the Southside’s increasingly confident Latino community, one that is emerging as a center for cultural and entrepreneurial activity. Although many Milwaukeeans in the last 20 years have had more and more interaction with Latinos at work, in churches, at entertainment venues, and in schools, the community’s 12% Latinos have been virtually invisible in the dominant media, which spends more and more of its time pandering to the suburbs. Except for a constant xenophobic drumbeat about the hordes of foreigners coming across the border by late-night AM radio shows and regular racial slurs by our local wannabee Rush Limbaughs — Mark Belling and Charlie Sykes — Milwaukee’s coverage of what is actually an American story — a quintessentially urban-American story — of immigrant struggle and success has been appalling. As Milwaukee’s Latino population has almost doubled in the last ten years, Latino radio, newspapers, entertainment, and businesses of all types have mushroomed with barely a peep from a press that has historically been a cheerleader for the Anglo-Saxon business class. The success of Milwaukee’s Latino workers and entrepreneurs in light of an almost total collapse of the industrial base in the 1970s and 1980s, which traditionally was an entry into living-wage jobs for Milwaukee’s immigrants, has been astonishing. This is not to say that we have reached a utopian Atzlan on the banks of the Menomonee River, given the educational achievement gap, lower incomes, unemployment, and poverty that exist in Milwaukee’s minority communities. However, we should recognize that the Southside has certainly enjoyed a resurgence based on the energy of our now second-largest minority population. What the march suggests for Milwaukee and the United States is that we have a choice between two worlds. In one, the world that Representative Sensenbrenner’s bill would create, children and workers are denied emergency health care, kept from having driver licenses, indefinitely detained by border agents, and lumped together with criminal terrorists and generally treated as outcasts. In the other, we can travel the bridge from the south to the north, like Milwaukee’s Latinos, to create the promise of an America that welcomes all who want to live here and that upholds, as its foundational principles, tolerance, justice, equal opportunity. Christopher Fons teaches US history at Riverside High School in Milwaukee, Wisconsin.